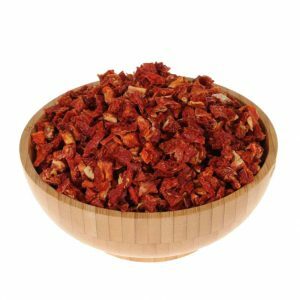 Diced Conventional Sun Dried Tomatoes – HERMES TARIM LTD. Product name, ingredients, net weight, date packed, shelf life, traceability, producer/exporter name & address, mandatory warnings and storage conditions must be noted on the label. Technological Properties : Foreign material separation, washing and drying process in drying chambers until the desired residual moisture in special design process line and humidification until desired moisture content. FUMIGATION : The product is directly fumigated with Methyl Bromide only in the raw material state before washing. After the product is packaged, it can be fumigated again in order to clear possible infestation originating from the container.